On January 24, 1848, James W. Marshall, a carpenter building a sawmill in partnership with John A. Sutter in California's Sacramento Valley, just about 50 miles from Nevada County, discovered gold in the running water of the mill. Sutter made each of the workmen promise to keep the discovery a secret for the few weeks needed to complete the mill and plant the spring crop. The news, however, somehow leaked out. Within a few months a shrewd merchant in San Francisco, named Samuel Brannan, devised a scheme to increase his business. Legend has it he ran down the streets of San Francisco waving a bottle of Gold Dust, yelling "Gold! Gold! Gold! Gold from the American River". The promotion was a huge success. Within a few days, boats filled with townspeople were heading up the Sacramento River for the gold fields. Brannan had stocked his store with mining supplies right beforehand, and made the first fortune of the California Gold Rush. But, there really was gold in "them thare" hills. During the summer of 1848 the news spread up and down the West Coast, across the border to Mexico, and even out to the Sandwich Islands (now Hawaii). Word also reached the East Coast, and on December 5, 1848, President Polk declared in a message to congress that there really was gold in California, and in abundance. In the earliest days of the Rush, claims yielding as much as $400 in a day were not uncommon. In the first year about 10 million dollars worth of gold was mined. As competition increased, fewer and fewer claims were to yield such riches. Statistics do not tell the true story, however, for the people who found practically nothing far outnumbered those who actually struck it rich. In 1848, gold was plentiful. The miners could pick it up or scratch it out of ravines, dry stream beds, and gulches. By the end of the year, however, dry digging gave way to wet digging. Miners put dirt, or gravel, which they called pay dirt, into the shallow washing pan. They held it underwater in a steam or river for a few minutes. The current would wash away the dirt and gravel, leaving the heavy gold on the bottom of the pan. By the end of 1849 there were so many miners that individual operations were replaced by larger ventures. Groups were formed to dry up riverbeds by diverting the water with dams. A method called "coyoteing" was rewarding - a shaft was dug about 30 feet deep into the bedrock along the shore of a stream. Then tunnels were dug in all directions to get at the rich veins of pay dirt. Whenever a strike was made, hundreds of miners would gather to stake their claims and build a camp. Each camp had it's own saloon and gambling house. The miners lived in little brush shanties constructed of old cloth tacked to a wood frame. The miners free time was devoted to drinking and gambling. Professional gamblers reaped fortunes, but the miners took their losses philosophically, figuring that there was always more gold in the diggings. Prices soared in this boom economy. Boots sold for $20.00 a pair, eggs for 50 cents each, and potatoes fetched $1.00 per pound. The abundance of rivers and streams in Nevada County, and the gold in them, made the Nevada County area boom. Many strikes occurred. Towns sprang up, some like Grass Valley and Nevada City are still thriving. 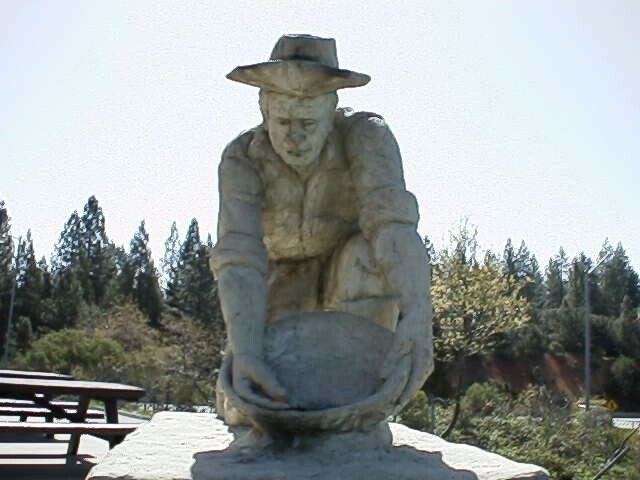 There still are folks who pan for gold in the many rivers of Nevada County. You have to work hard at it and be lucky, but there still is gold "to be had," though the folks selling the gold pans still seem to be the ones making the most money! Got a page or link to add here?